Exactly when Cyril took his leave of Denham has not been determined. It is however generally accepted that he had started working in the auto body repair & salvage business in the early '50's. 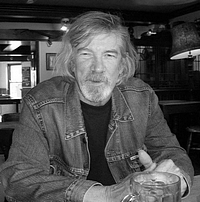 'Herts and Beds' bluesman, Uncle Bob, says that having been introduced, at the age of 15, to the delights of jazz and blues by the school art teacher, Paul Oliver (who later went on to become THE authority on blues and blues history), he started going to jazz clubs with a friend. 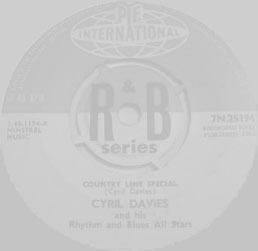 So it was that he first heard and met one of his early inspirations, Cyril Davies, who was at the time playing banjo with Steve Lane's Southern Stompers, and singing Leadbelly songs to a guitar as an extra. Bob said It must have been in the autumn of 1953 that my friend John and I cycled over to North Harrow on a Thursday night to go to the Harrow Jazz Club, only to find it had been closed down. After a moment or two wondering what to do John said "What about going to see The Southern Stompers at The Fox and Goose at Alperton?" We'd heard about them. "OK", I said so we got back on our bikes and went there. The band played sitting down, knee deep in trumpet mutes with little music stands in front of them. The banjo player did the occasional vocal on stuff like 'Doctor Jazz' (ed. - King Oliver/Walter Melrose) - that was how we first saw and heard Cyril Davies. We started to go there quite frequently for a year or more. My memories, after so long are a little hazy, particularly as I was only just getting into jazz at that time, but I well remember one night, soon after we'd started going there, the band taking a break and Cyril producing a guitar and singing 'Frankie and Johnny' (ed. traditional) solo - these intermissions soon became a regular feature. I can also clearly recall him doing Leadbelly's 'On A Christmas Day'. These (instances were) the first I'd ever heard of that kind of music being performed live. Fairly early in this period we could recall [Cyril] him doing an impromptu thing on which trumpeter Steve Lane played guitar and Cyril sang and blew over the lip of a trumpet mute to produce a jug type effect. However some weeks later when we'd actually got round to talking to him, and asked him what it was called and would he do it again, he couldn't remember doing it! He seemed to enjoy his beer, and could sink a pint or two (!). My drummer Dave was, it turns out, frequenting The Fox and Goose at about the same time (although I didn't know him then) and was likewise impressed by Cyril. He recalls him doing a very good version of 'Rock Island Line', which he says was much better than the later hit record by Lonnie Donegan." 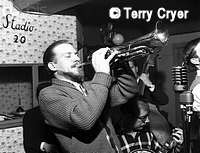 Ken Colyer was Britain's leading New Orleans styled trumpeter. His dedication to New Orleans music had a profound effect on the British music scene and laid the ground for both the Skiffle boom and the British Blues scene. 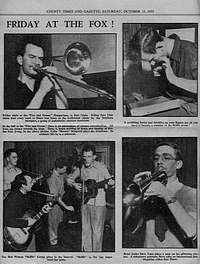 In 1952, Ken left the Christie Brothers' Stompers to search out the men who had created the music he loved. Ken rejoined the Merchant Navy, determined to get to New Orleans. After an arduous journey he arrived late in the year. When his visa expired he was arrested and put into the Parish Prison (for about a month) before being deported from America shortly after, early in 1953. 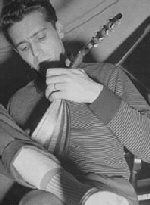 Alexis Korner explains - Ken Colyer had come back from New Orleans and we made a promise to each other that, when he came back, we'd see if we could do something about getting a skiffle group together. He joined Chris Barber when he came back and it became the Barber / Colyer Jazzmen. In that, there was a skiffle group. It consisted of Chris Barber on bass, Ken Colyer on guitar, Bill Colyer on washboard, Lonnie Donegan on guitar and vocals and me on guitar, mandolin and, for a couple of weeks, very occasional harmonica because I was one of the first and one of the worst harmonica players in the country. We dropped that one very quickly. Shortly afterwards, Ken left to form his own jazz band and skiffle group. 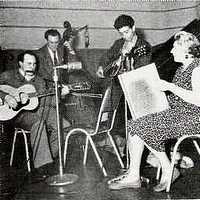 This new skiffle group featured Ken (guitar), Bill Colyer (washboard), Johnny Parker (piano), Mickey Ashman (bass) and Alexis on guitar and mandolin. Recording Back To The Delta for Decca on June 25, 1954, the LP contained Midnight Special, Casey Jones, and K.C. Moan. Soho fits neatly into an area bordered by Oxford Street in the north, Shaftesbury Avenue in the south, Regents Street in the west and Charing Cross Road in the east. 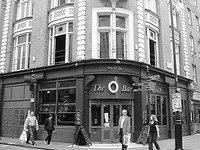 In the 1950's and 60's, Soho was the main artists' quarter in the capital. Jazz came to England via Soho in the 1950's. The most famous jazz club in Soho was and still is Ronnie Scott's on Frith Street. From Skiffle - The Definitive Inside Story, Chas McDevitt picks up the story; Cyril Davies and Bob Watson had opened The London Skiffle Centre at the end of 1955. The club met on the first floor of the Roundhouse Pub...Every Thursday night one could be sure to hear Cyril belting out one of his favourite Lead Belly songs, eyes firmly closed, ruddy faced, his features looking fit to bust. He played a custom built Emile Grimshaw 12 string guitar and occasionally the harmonica. Bob Watson, a Woody Guthrie enthusiast, balanced the proceedings with his selection of material, and floor singers were encouraged. Knights of the Blues Table is a CD originally conceived as a tribute to Cyril Davies and Alexis Korner. It ended up as a more general celebration of the genre's origins and rich history. In addition to the smokin' performance by Jack Bruce on the previously unheard blues Send For Me [penned by Cyril], the 'album' also includes a 1954 home recording of Cyril performing his own version of KC Moan! Alexis would continue to play with The Ken Colyer Skiffle Group, recording with them a few more numbers. Feeling more comfortable with his skill level, Alexis was also working solo, guesting occasionally at The London Skiffle Club. Dubbed Britain's queen of the blues by no less than Ella Fitzgerald, vocalist Beryl Bryden was born in Norwich, England on May 11, 1920. Relocating to London during the late 1940s, Bryden aligned herself with the growing trad-jazz movement, singing and playing washboard with acts including George Webb, Freddy Randall, Alex Welsh and Chris Barber. In the early 1950s, Beryl was becoming a major attraction throughout Europe with a repertoire that included not only jazz fare but also blues favourites and even classic vaudeville numbers. Chas McDevitt - During the Skiffle era [Beryl Bryden's Backroom Skiffle] included Alexis Korner on guitar, Cyril Davies on 12 string and harmonica, Frank Cash on bass and Dave Stevens on piano. 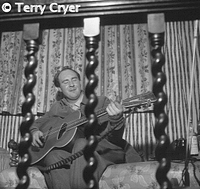 They recorded four tracks for Decca, but only two were released, Kansas City Blues and Casey Jones. The other tracks were Rock Me which had a huge echo surge on the master, a fault evident on other Decca skiffle releases, and This Train which includes a fine harmonica solo from Cyril Davies. Beryl certainly chose her musicians well! In 2003, Mr. Chas McDevitt kindly shared the following memories of this period - I saw Cyril Davies live on many occasions, often with Alexis Korner. I remember seeing him play his 12 string and sing at the Roundhouse on Wardour Street in 1956, we all used to sit in there. Although I had heard House of the Rising Sun before, by Josh White etc., it seemed to me that Cyril was playing it in a major key. I went home, rehearsed it, and in early December 1956, we recorded New Orleans for Oriole. Either I'd got it wrong or Cyril was really playing that way. Alexis - Cyril said to me one day, "Look man, I'm tired of all this skiffle stuff. If I close this place down, will you come in with me and open it up as a blues club?" So I said, "Sure, why not? Yeah, let's open a blues club". So he closed down the London Skiffle Club which was packed every Thursday night, absolutely packed to the ceiling and it was tremendously successful. We closed it down for a month and opened it up again as The London Blues and Barrelhouse Club, and three people came on the opening night. Three people and there was four of us on the stand. "Never mind", we thought, "to hell with this", and we played. Bit by bit, more people came. It was also a time when a lot of black American players were coming over, and also white players like Jack Elliot and Derroll Adams, and people like that. They all use to come up to the Roundhouse on Thursday. So, sometimes [we] used to get about twenty-five musicians and twelve [in the] audience. But all in all, that was quite a few people in the place, and it sort of swung itself round. While at the Roundhouse, Cyril Davies found his calling. Having taken up the 12 string guitar, he became absolutely obsessed with blues music - especially the music of Leadbelly. This page and all its contents, ©2012, all rights reserved.